Up to £50,000 Failure of Suppliers Cover at John Lewis Wedding Insurance One thing going wrong can seriously impact your big day, but you won't be out of pocket when you're covered for up to £50,000 with John Lewis Wedding Insurance. Up to £100,000 Cancellation or Rearrangement Cover at John Lewis Wedding Insurance Emergencies happen, but be prepared with John Lewis Wedding Insurance and claim up to £100,000 if you need to rearrange the big day. Up to £15,000 Wedding Ring Loss or Damage Cover at John Lewis Wedding Insurance You've spent a lot of money on the rings, and they're a vital part of any wedding. Make sure you're protected in case anything happens to them with John Lewis. Up to £50,000 Loss or Damage Cover at John Lewis Wedding Insurance Once you've put so much effort and time into making your big day into a dream come true, don't let it turn into a nightmare. Get covered against loss or damage up to £50,000. Up to £10,000 Legal Expenses Cover at John Lewis Wedding Insurance Make sure you don't miss out on legal expenses for your big day - get covered at John Lewis Wedding Insurance. Heaven forbid a catering cancellation, dress disaster or wedding cake let down - when you look back on your wedding day, you’ll want to remember what a beautiful time it was - to bring you tears of joy and not sadness or stress. It shouldn’t happen, but sometimes, what is out of our control can dampen our plans, which is why the wedding insurance at John Lewis Finance is designed to protect you and everything about your special day. Now you won’t suffer the consequences should the unimaginable occur - loss or damage, cancellations, wedding ring mishaps and more - with the choice of six different levels of wedding and civil partnership ceremony insurance available, you will be sure to find one that'll suit you and your event. From Level 1 through to level 6, all of the Policies have different amounts of comprehensive cover included and are carefully underwritten by Royal & Sun Alliance plc. This is reliable protection when you need it the most. Because after all, most of us only get hitched once, and for that, you should certify yourself to have an incredible experience that's worry free. John Lewis Wedding Insurance will keep you and your plans safe, for all types of weddings and Civil Partnerships - this really is an investment worth making to kick off your happily ever after. How do I use my John Lewis Wedding Insurance promo code? All other discounts will be automatically applied on your premium so you can continue to complete the transaction. Want a few hints and tips on how to make your wedding a little more unique while saving on budget too? Take a look at the Wedding Information Centre for the low down on how to be your own Wedding Planner. Will John Lewis Finance cover weddings abroad? Yes, you will need to select this as your cover option when choosing your Policy level. Please note that you should take out separate travel insurance. Will our honeymoon be covered by the Policy? Honeymoons do not fall under the policy so do ensure that you get insurance for this separately. To make a claim you should contact John Lewis Finance on 0330 102 2759 with as much information regarding your receipts and contracts to hand. Lines are open Monday to Friday from 8am to 8pm, Saturdays from 9am to 5pm and closed on Sundays. You can also reach John Lewis Wedding Insurance online via their contact form. On your wedding day, the most important day of your life - you want to make sure that you're covered for every eventuality. With Wedding Insurance from John Lewis Finance, you can do just that, with policies to suit all needs and budgets. Now with a John Lewis Wedding Insurance promo code to hand, you can help cut the cost too. So just incase the day's events don't quite go as planned - find reassurance in trustworthy cover from John Lewis Finance. John Lewis Finance understands that organising a wedding isn't all wine tasting and choosing bands - with a hundred and one things to do and places to be at one time - some people love the rushing around and some can find it rather daunting. With a Stress Counselling Helpline available to call, John Lewis Finance really is with you every step of the way with your wedding. Whenever you need to speak to someone besides your friends or loved ones, you can count on their qualified counsellors to get you through it. For a wedding like no other, why not take the marquee route over the castle or manor house that's booked up for years to come? 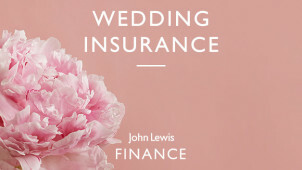 With John Lewis Finance, you can add Marquee Cover to your insurance policy, all for less with a John Lewis Wedding Insurance discount code to lower the price. Be sure to check with the marquee company that the location you wish to use is suitable and that you know whether tables, chairs and any other equipment will be provided - then let John Lewis Finance take care of the rest.